Regulatory information management software consists of software solutions suiting to the respective industry and nature of business, especially for pharmaceutical, biotechnology, and clinical research industries. The software allows manufacturers and respective personnel in the aforementioned industries to ensure strict observance of complex regulations set by regulatory authorities in the respective regions. The regulatory scenario in the industries such as biotechnology, pharmaceuticals, and clinical research tend to be highly critical and keeps updating at frequent intervals. This has led to development of competent regulatory information management software to be adopted by industry players. This ever-changing regulatory scenario in such industries proves to be one of the important driving factors for adoption of regulatory information management software. Also, reduction in manual errors in the software designed for regulatory process coupled with easy access are further expected to contribute in growth of global regulatory information management market. Among product type, software segment is expected to account for the largest market share by 2026. Need to cope up with ever-changing regulatory scenario, especially in the field of pharmaceuticals, is increasing and this has led organizations to opt for regulatory information management software. The software for regulatory information management is among the most feasible and easy way to keep track of the production and manufacturing scenario in accordance with the updated regulatory norms in the respective region. Regulatory information management software are offered with various features, which help organizations to follow updated regulations. The innovation and advancement in the field of software with improved process to ensure effective management of regulatory information, the software also ensures reduction in turnaround time for any issues or malpractices in the system. Pharmaceutical companies are involved in development, dissemination, and control of the regulatory information throughout the product development cycle. Regulatory information management is an important solution for pharmaceutical companies as it effectively communicates regulations. The technology tools, product & service platforms, creates opportunities for automating business practices resulting in optimum business output with rigid observance of the set norms in the industry by regulatory bodies and government. In pharmaceutical industries, regulatory information management software facilitates robust application of planning, viewing, publishing, registration, and management of products throughout its life cycle. The software also allows effective compliant management of regulations and regulatory information. It has advantages such as submission of plan, e-submission viewer, and product registration and tracking. The software enables tracking the periodic safety updated reports (PSUR) and real time access of regulatory information. North America is anticipated to be dominant in the regulatory information management market, due to high presence of pharmaceutical companies such as Amgen, GlaxoSmith, Novartis, Johnson & Johnson, and Gilead Sciences among others in countries such as the U.S. and Canada. Furthermore, according to a report by European Federation of Pharmaceutical Industries and Associations (EFPIA), in 2016, North America accounted for 49.0% of world pharmaceutical sales compared to 21.5% of Europe. According to IMS Health data (MIDAS May 2017), 64.7% of sales of new medicines launched during the period 2011-2016 were in the U.S. market, compared to 17.5% in the European market. This depicts the potential of North American as well as European markets for adoption of regulatory information management software. North America is followed by Asia Pacific in terms of market share in the regulatory information management market, owing to growing pharmaceuticals industry in countries such as China and India. This is evident with the fact that, according to International Trade Administration, rising per capita income, aging population, greater access to healthcare, and regulatory reform are key drivers that will enhance the appeal of China's pharmaceutical market. Organizations have to adhere to certain regulations for production and development of products, solutions, and services. This software ensures that these organizations adhere to the regulations, which in turn helps them to reduce downtime or production of the products, which are not in line with the set regulatory standards. The software is most suitable for application in industries such as healthcare and life sciences, where the regulations need to be updated regularly and followed strictly, owing to its sensitivity and direct effect on the lives of the consumers of the medicines. 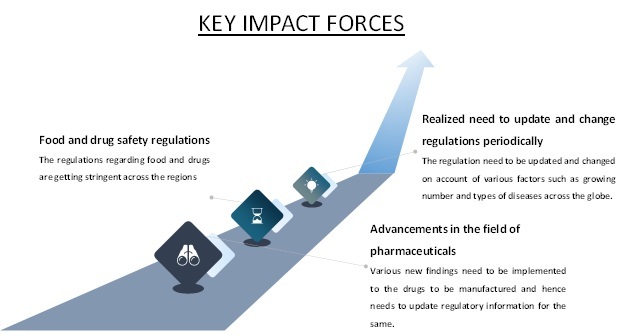 Market for regulatory information management is expected to exhibit significant traction, during the forecast period, owing to factors such as increasing stringency of the norms provided by regulatory bodies such as U.S. Food and Drug Administration (FDA), European Medicines Agency, and other similar agencies in the respective regions globally. The regulatory scenario is complex and always changing, therefore to keep up with regulatory requirements across global markets is challenging. According to the European Union Drug Regulating Authorities Pharmacovigilance Medicinal Product Dictionary (EVMPD) regulations, all pharmaceutical companies harmonized exchanged format to manage the drug safety product information, which was effective from July 02, 2012. Pharmaceutical companies tend to adopt advanced technologies such as regulatory information management systems. This enables respective personnel of these companies with easy access to information at any time. The reduction in manual errors in regulatory process coupled with easy access to all the information are further expected to contribute in growth of global regulatory information management market. Apart from healthcare and life sciences, this software is also being adopted in the multiple industries such as biotechnology and clinical research organizations as they vary in terms of degrees of maturity when it comes to regulatory processes. Companies covered as part of this study include Acuta, Llc, Parexel, Computer Sciences Corp (CSC), Aris Global, Virtify, Ennov, Amplexor, Samarind Ltd., Dovel Technologies, Inc., and Informa. Stakeholders would have ease in decision-making through various strategy matrices used in analyzing the global regulatory information management market.